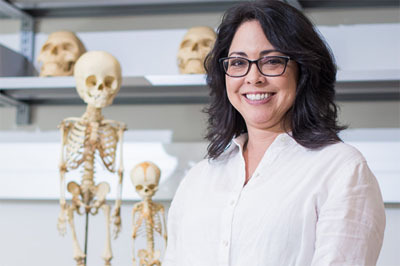 If Midori Albert’s lab brings to mind an episode of “Bones,” that’s understandable. Like the fictional television character, Albert is a forensic anthropologist who sometimes works with law enforcement. More often, however, she is teaching or advising students as a member of the UNCW Department of Anthropology faculty. 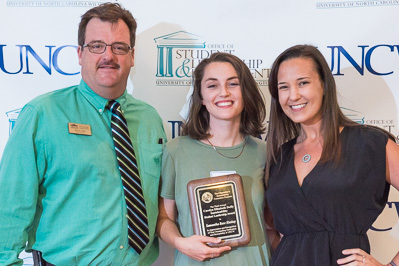 Samantha Huskey ’18 is pictured with Stan Harts (director of environmental health and safety) and Kat Pohlman (sustainability coordinator) at the 2017 Cornerstone Student Awards Banquet held on April 18 in the Burney Center. Huskey received the Carolyn Elizabeth (Lizzy) Duffy Student Sustainability Award.